It can be hard to imagine crows as anything but ubiquitous. During winter across the country, dusk marks the time where some cities see their skies turn black with thousands, even hundreds of thousands of American crows converging to roost. These crows have taken nearly all that people have thrown at them: deforestation, mass waste, and the urban sprawl that simplifies previously complex ecosystems, and uses it to their advantage. Not all species of crow have thrived in the Anthropocene, however. Far from being icons of the ultimate adapters some species of crow represent some of the most endangered animals in the world. Among those, the ‘Alalā or Hawaiian crow, is arguably one of the rarest birds on earth. Once locally abundant in the forests and woodlands of Hawaii’s Big Island, their decline began in the 1890’s following persecution by coffee and fruit farmers1. Back in September, 2015 there remained only 114, all living exclusively in captivity giving them the unenviable title of ‘extinct in the wild’. How can one species thrive with such zeal while another holds on by a thread? Island species are generally more specialized and therefore more sensitive to human induced changes. In fact proportionally, islands host a higher number of endangered or extinct species than continental areas2. In Hawaii alone, 77 different species of endemic birds have gone extinct since the arrival of the Polynesians 2,000 years ago4, all largely for similar reasons: habitat destruction and invasive species. Unlike their generalist, continental counterparts, the ‘Alalā is more specialized to feed on understory fruits and nuts and in fact were key seed distributors for many of Hawaii’s native plants. Island living also fostered a similar behavior seen in only one other species of crow: tool use. Like the New Caledonian crow, the ‘Alalā is a dexterous tool user, though the two species are only distantly related. Scientists believe this example of convergent evolution is fostered by aspects typical of islands, namely low predation and low competition for embedded food5. Unfortunately, limited distributions and higher specialization also meant their population was more fragile than that of continental crows. Logging, agricultural development, loss of native pollinators, and alterations by non-native ungulates challenged both food acquisition and breeding habitat. Introduced diseases such as avian pox, malaria and the Toxoplasma gondii parasite carried by cats further weakened an already ailing population6,7. Invasive predators including rats, mongoose and cats consumed eggs, nestlings and fledglings. Finally, humans continued their tradition of persecution, particularly feral pig hunters who would shoot the birds before they could alarm call and scare off their prey2. Together, these threats set into motion a decline in population we failed to recover despite some increases in research and management starting in the 1970’s. The last known wild egg was laid in 1996, and the last wild pair was seen in 20022,3. Some people did recognize the urgency of their decline prior to 2002, however, and a captive breeding population was started successfully rearing over 90 birds8. Although such a small number of breeders may raise red flags with respect to inbreeding and genetic depression, this is rarely as big of an issue as is commonly perceived. Unfortunately, light management and depredation by the also endangered Hawaiian hawk (‘io), decimated the released population and reintroduction efforts were halted in 1999 until a larger captive population and better management strategy could be devised. Since that time, the ‘Alalā Restoration Project (collaboration between the State of Hawaii, the U.S. Fish and Wildlife Service, and San Diego Zoo Global) has spearheaded captive breeding programs on Maui and the Big Island culminating in a population of over 100 birds. An important part of these captive breeding programs is the use of puppets, which help prevent habituation to humans9. In addition, intensive management operations have taken place to ready their prospective home at the Pu‘u Maka‘ala Natural Area Reserve including the removal of invasive/feral animals, erecting exclosure fencing, and constructing a sort of half-way house to help ease the birds into life in the wild. These efforts have not been without setbacks, however. Back in June, 2015 two miles of protective fencing was cut down by vandals, though their motivations remain unknown. Finally, after so much work, the end of 2016 marked the first time researchers and managers agreed the elements were in place for a reintroduction effort. On December 14th, five male birds were released onto the reserve, marking the first time the ‘Alalā set claw into the wild since 2002. Sadly, within weeks all but two had died. Two were killed by the native Hawaiian hawk or ‘lo, and the third was killed by “natural circumstances” which, I’m guessing, is related to a heavy storm that occurred shortly after their release. As a protective measure, the remaining two were recaptured until the results from the necropsies are obtained. While clearly disheartening, early hiccups in a release effort like this are not unusual and conservationists and biologists are not losing hope that success is still possible. Part of ensuring such success, however, is undoubtedly public support particularly with respect to maintaining the strength of the Endangered Species Act and support of the ‘Alalā Restoration Project. The perception that all crows are alike or that generous populations of American crows means protections for other corvus species is unwarranted or redundant will be a disaster for these rare birds. So make your voice heard when funding for conversations efforts come under fire, and share your passion for endangered corvus species with friends and family. The fate of the world’s rarest crow quite literally depends on it. Faike, E. 2006. Wild voices in captivity: the date of the ‘Alala. Birding 38: 64-67. Rutz C, Klump BC, Komarczyk L, Leighton R, Kramer J, Wischnewski S, Sugasawa S, Morrissey MB, James R, St Clair JJH, Switzer RA, and Masuda BM. (2016). Maxfield, B. 1998. Wild ‘Alala population suffers major setback. ‘Elepaio 58: 51. Liebermann, A.; Nelson, J. T.; Simmons, P.; Unger, K.; Vitousek, P. M. 2003. Draft revised recovery plan for the Alala (Corvus Hawaiiensis. US Fish and Wildlife Service, Portland, OR, USA. Lieberman, A. C., Kuehler, C. M. 2009. Captive propagation. In: Pratt, T. K.; Atkinson, C. T.; Banko, P. C.; Jacobi, J. D.; Woodworth, B. L. (ed. ), Conservation Biology of Hawaiian Forest Birds: Implications for Island Avifauna, pp. 448-469. Yale University Press, New Haven. Since the nineties, Avian Keratin Disorder has been an increasingly common disorder among Alaskan and PNW crows, chickadees (~17% of northwest crows1, ~6% of black-capped chickadees2) and a handful of other species, that causes gross deformities of the beak such as elongation, curvature or crossing. I’ve written previously about the details of this disease before, but at that time there was little progress in determining the underlying source of the outbreak. While AKD can be caused by a variety of things, at the scale it’s being observed now scientists questioned if there was a more consistent underlying factor. Since AKD can cause discomfort or even death (primarily through the inability to feed or preen) understanding what might be the source of this outbreak has clear management and conservation implications. An AKD-afflicted American crow in Seattle, WA. Among the initial suspects were environmental contaminants such as heavy metals, organic pesticides, and toxic environmental pollutants like PCBs, PCDDs, and PCDFs. Blood work done on afflicted Northwestern crows, however, showed no significant difference in the 30 blood elements tested compared to unaffected adults or juveniles3. Fortunately, new research may finally be shedding light on what’s going on. Disease can be an easy thing to rule out if you know what you’re looking for, but new to science pathogens can evade traditional diagnostic techniques. To account for this, a team of USGS and university scientists conducted a sequencing study comparing pooled RNA of healthy and AKD positive chickadees, crows and nuthatches in attempt to identify a candidate pathogen2. Their work appears to have paid off, revealing evidence for a new picornavirus (a family of viruses previously known to science) they are calling poecivirus. Whereas 100% of AKD-affected birds (23 subjects) tested positive only 22% of the 9 control individuals did. Given these small sample sizes, it’s too early to throw our hands up in complete relief of having identified the cause of the AKD outbreak, especially since there’s still much to be done in understanding the potential relationship of this new virus to the environment. Nevertheless, these findings offer some insight and hope that scientists are on the right track. With more dedicated work we may soon have a much better understanding of this novel pathogen, its link to AKD, and management options moving forward. I’ve talked before about how the claim that crows (and ravens) are “destroying the ecosystem and songbird populations” is mostly unsupported by science. Breeding plovers and desert tortoises are among the handful of exceptions1,2. Nevertheless I still see, even in the comment threads of this very blog, people claiming that corvids are out of control and have no predators. If it wasn’t such a misguided and ultimately dangerous sentiment I might just ¯\_(ツ)_/¯ whenever folks claimed that crows and ravens have no natural predators because those of us who spend even a small amount of time observing them in the summer will know this is anything but true. Eggs and baby birds are a key summer food source for lots of animals and, while seeing a downy little gosling in the mouth of an arctic fox makes me cringe a little, knowing a healthy population of breeding birds is helping to sustain a community of predators is the kind of ecological balance that, in the long run, makes my heart sing. 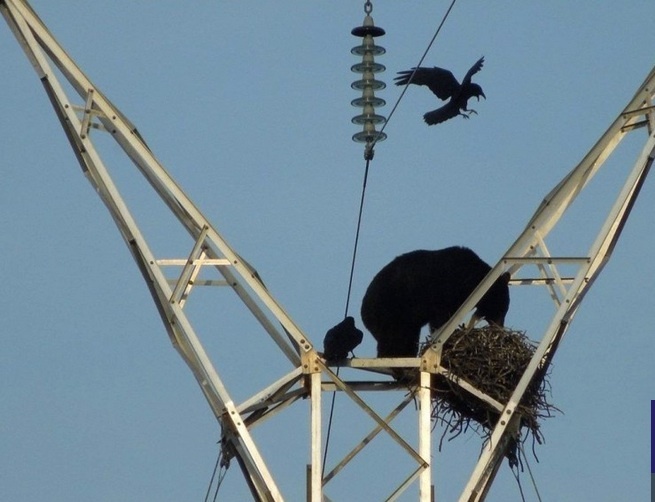 Corvids are part of this system too, which means their babies are also getting eaten. Usually it’s by things like hawks, eagles, owl and racoons but a recent video taken in Alberta shows yet another predator we can bear in mind. It’s never gonna be fun to see the birds I care about taking a hit like this, but knowing that corvid babies are helping to sustain top predators only deepens my love and appreciation for them. Predators and prey make the world go round and corvids have the badass role of being both.